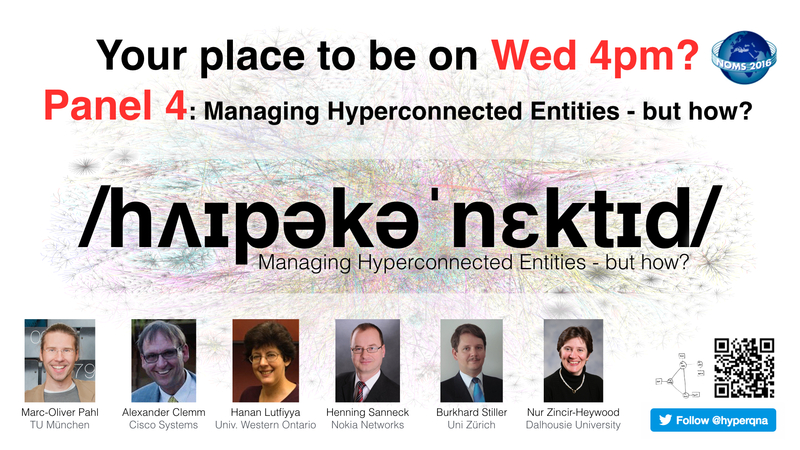 Marc-Oliver Pahl | NOMS 2016 panel on Challenges and Opportunities of Managing Hyperconnected Entities. Managing Hyperconnected Entities - but how? More and more entities allow remote management. This observation applies within the Network Management (NM) community and outside it. The sphere where the use of NM methodologies and tools can be beneficial expands. Recent examples such as the Internet of Things (IoT), Software Defined Networking (SDN), and Network Function Virtualization (NFV) bring challenges and opportunities to the field. Major challenges are caused by the increased interconnectivity of entities, their increased functional diversity, their increased amount, and their increased protocol heterogeneity. Major opportunities arise by adapting well-understood mechanisms and tools from the NM domain to new applications. We want to discuss with you, if, why, and how facing new challenges requires adapting and extending existing NM methodologies. We want to discuss which opportunities can be created and which circumstances ideally have to be met. Who provides what, where, in which way, and when in the future? More information about us, the panelists. What does managing a hyperconnected world mean to you? Who shall provide what, where, in which way, and when in the future? In smart spaces, everyone should be enabled to implement management algorithms. Dr. Marc-Oliver Pahl (pahl [at] tum.de) is a senior researcher and lecturer at Technische Universität München. He joined the chair for Network Architecture and Services in 2008 where he leads the Smart Space Orchestration research activities. His research focuses on novel methods for entity management in dynamic heterogeneous environments such as the Internet of Things. Marc-Oliver Pahl studied Informatics at the Universität Tübingen with emphasis on computer networks, computer graphics, and media science. He holds a PhD degree from Technische Universität München. Marc-Oliver Pahl is the first author of more than a dozen research papers. He is working as reviewer for different journals and conferences. Marc-Oliver Pahl teaches at German Universities since 2003. He was among the first to introduce blended learning into the regular student education in Germany. In 2013 he received the Ernst Otto Fischer teaching price of Technische Universität München. Marc-Oliver is a member of IEEE and ACM. He is currently a member of the IEEE Technical Committee on Factory Automation (TCFA). Observation will eat planning's lunch. Dr. Alexander Clemm (alex [at] cisco.com) is a Principal Engineer at Cisco where he provides technical direction and leadership for technology that relates to manageability of Cisco networking products. In addition to papers and patents, he has authored or edited several books related to management technology, including “Network Management Fundamentals” (Cisco Press 2006) and “Network-Embedded Management and Applications” (Springer 2013). Alex also served as TPC Co-Chair of IM in 2005 and as General Co-Chair of Manweek (now CNSM) 2007 and of IM in 2013. Alex holds a Master of Science in Computer Science from Stanford University and a PhD from the University of Munich. All management entities must be context-aware. Prof. Dr. Hanan Lutfiyya (hanan [at] csd.uwo.ca) is a Professor in the Department of Computer Science at the University of Western Ontario. Her research broadly falls into distributed systems and software engineering. More specifically she is interested in systems management. Verticals (automotive, industry 4.0) will require customized management (abstraction, reduced complexity) for customized services in a virtualized network infrastructure. Dr. Henning Sanneck (henning.sanneck [at] nokia.com) studied Electrical Engineering at the University of Erlangen-Nuremberg, Germany. After receiving his Diploma in 1995, he joined GMD Fokus (now part of Fraunhofer) in Berlin. At Fokus, he worked as a Researcher in the area of Quality-of-Service (QoS) support for Real-Time Services in IP-based networks. He received his Dr.-Ing. (PhD) degree in Electrical Engineering from the Technical University of Berlin with a thesis on Voice over IP QoS in 2000. In 2001 he joined Siemens - Mobile Networks in Munich, as a Senior Research Engineer. He became a Project Manager for technology innovation projects in the area of Network Management for 3G and beyond RANs in 2003, working on Basestation Auto-Configuration and Real-Time Performance Management concepts and their realisation as product features. In 2007, at the formation of Nokia Siemens Networks (now: Nokia Networks), Henning started to lead the "Network Management Automation" team as a Research Manager with a focus on LTE Self-Organizing Networks (SON), in particular Self-Configuration, -Healing and SON Operation. Since 2014, as Head of Cognitive Network Management, his responsibility also includes the internal coordination of Research and Standardization work in Network Management Automation. Dr. Sanneck has published 70 papers in refereed conferences and journals and has 30 patents granted or published. He is co-editor and -author of the book "LTE Self-Organizing Networks (SON)". Decentralized management combined with economics principles is the key. Prof. Dr. Burkhard Stiller (stiller [at] ifi.uzh.ch) received his diploma degree in computer science and his doctoral degree from the University of Karlsruhe, in 1990 and 1994, respectively. From 1991 until 1995 he has been a Research Assistant at the University of Karlsruhe, being on leave in 1994/95 for a one-year EC Research Fellowship at the University of Cambridge, Computer Laboratory, UK. From November 1995 he has been with the Computer Engineering and Networks Laboratory TIK of ETH Zürich. He was appointed Assistant Professor for Communication Systems at ETH in 1999 and hold that post until September 2004. Burkhard Stiller held additionally from April 2002 until August 2004 a Chair at the University of Federal Armed Forces Munich (UniBwM), where he headed the Information Systems Laboratory IIS and had a part-time appointment with ETH Zurich. Since September 2004 Prof. Dr. Burkhard Stiller holds the Communications Chair at UniZH, IFI. Prof. Dr. Nur Zincir-Heywood (zincir [at] cs.dal.ca) is currently a Professor of Computer Science at Dalhousie University, Canada. She received her PhD in 1998 in Computer Science and Engineering from Ege University, Turkey. Prior to moving to Dalhousie in 2000, Dr. Zincir-Heywood had been a researcher at Sussex University, UK and Karlsruhe University, Germany as well as working as an instructor at the Internet Society Network Management workshops. She has published over 150 papers on networks, security and intelligent systems. She has substantial experience of industrial research in autonomous systems, network management and security related topics with partners such as RUAG, Raytheon, Gtech, Sandvine and Public Safety Canada. She is a member of the IEEE and the ACM.